Welcome to the Cotswolds, which boasts more than its fair share of charming stone cottages. 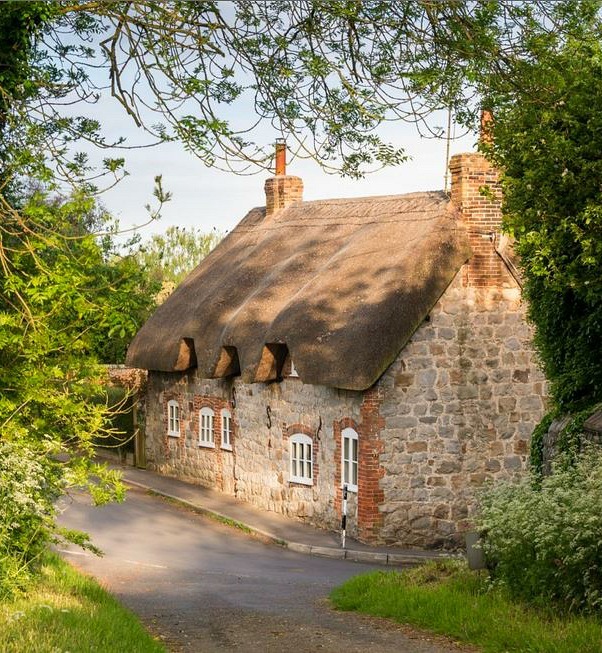 Today I’m daydreaming about taking a Cameron Diaz-style holiday in a small, 400-year-old house known as Honey Pot Cottage. Have you been to the Cotswolds? I’ve never made it to this part of England, but I’d love to see it someday. For rental information, visit Unique Home Stays (2019 update: sorry, but the listing has been removed). Now I want to re-paint our exterior doors pale blue like these, + I was already anxiously awaiting the planting something fragrant and climbing! I just worry that something fragrant like flowers near doorways to the hous will attract bugs and rodents. Wow! Just wow! So stunning in every way. I would love to visit there someday too. 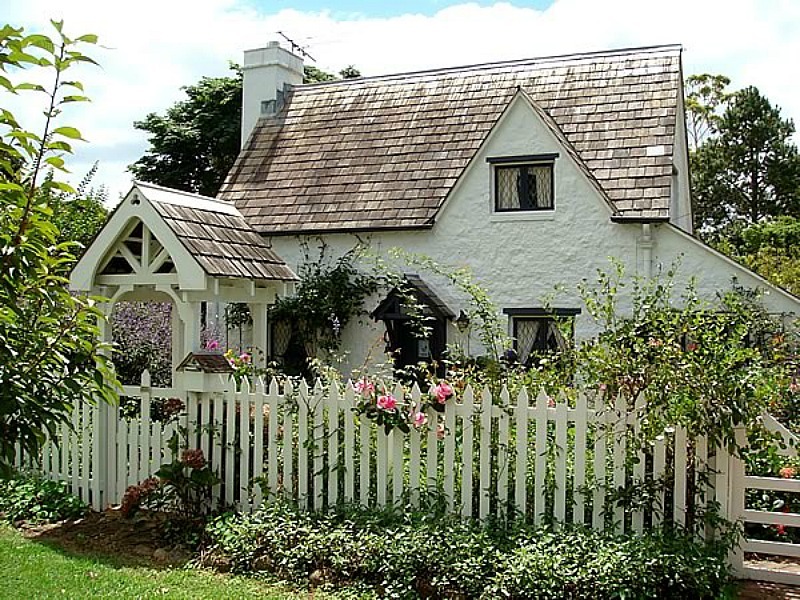 What a delightful little cottage this is! I’ve been hooked on Midsomer Murders because it is chock full of beautiful English cottages and villages. It’s a long-running series (100 episodes) available on streaming Netflix. This cottage would fit right in to its scenery. You’re right, Barbara, it really would! I love the English houses on that show. I HAVE been to the Cotswolds and it truly is as magical and dreamy as you imagine. My husband’s employers own an estate there. Last year when we visited, he and I walked to Stow on the Wold which is the town nearest the estate. I took a million photos of church gates and gorgeous wooden doors painted every shade in the rainbow. The stone cottages are amazing! It’s really the authentic England I always dreamed of visiting and it IS straight out of The Holiday. Thank you for sharing this!! I have visited The Cotswolds as well! We saw Stow on the Wold (my favorite), Great Tew (a whole village of thatched roofs! ), Gloucestershire, Cirencester, and, of course, Bath. It really is so charming. Lots of quaint B&B’s, tea shops, true English pubs, and sheep. Yep, lots of sheep! The countryside is gorgeous against the Cotswold stone. Probably one of my favorite places I have every visited! Now this cottage is very modern compared to most places we saw, but it is really done beautifully and maintained wonderful character. Just lovely! My favorite style of all houses! The humble Cotswold Cottage! I’ll take this style of home over all others (I live in one, in the deep South) – I could live the rest of my life in this beautiful place and be forever happy! Thank you for sharing the photos and giving your readers a peek inside such a lovely home! This is just beautiful! I’m pretty much convinced I want to paint our bedroom that same shade of blue; I’ve seen it several times now and it looks so restful. Not as charming inside as out. I was expecting some of those stone walls showing inside too. I’ve been to Burford several times and I think it’s the most charming village in the Cotswalds. The last picture captures it perfectly. This post brings back wonderful memories of some great vacations. What a charming little place. It’s always been a dream of mine to visit the Cotswalds, so when we were in England last year we scheduled a day tour. I looked forward to it more than anything else we had planned. Unfortunately, my husband became ill and we missed the tour. Luckily, he recovered in a few days but I was so disappointed. I’ll keep it on my bucket list. Hi Julia, I’m sorry my comment is a bit late, I love this cottage and the views …. WOW. Speaking of British countryside and their beautiful homes, we have a show over here called Escape To The Country, I don’t know if you get this program over there, if you enjoy watching the views on Doc Martin you will love this show. I’m into Christmas movies at the moment, and right now I’m watching 12 Dates Of Christmas its a nice movie with the snow and twinkling lights, and I look into our garden and what I’m seeing over our side of the planet, well… not a creature is stirring not even the bunny that drops in for some food it’s just soo…hot. Thank you for sharing beauty. Till next time regards Esther from a scorching Sydney. Love this! I think cottages like this are my favorite type of home. Yes, I stayed in the Cotswolds as part of a trip to England over 10 years ago. Looks like it hasn’t changed much! We stayed in a B-and-B in Bampton in the Bush. I loved it so much. Hi Julia, This is my first time writing to you. I really enjoy website, and those quaint, adorable cottages just lovely. Visiting the English countryside is on the top of my bucket list, working on that for awhile now. Since, I will be traveling by myself, it should be quite the adventure. Always looking forward to reading your site.